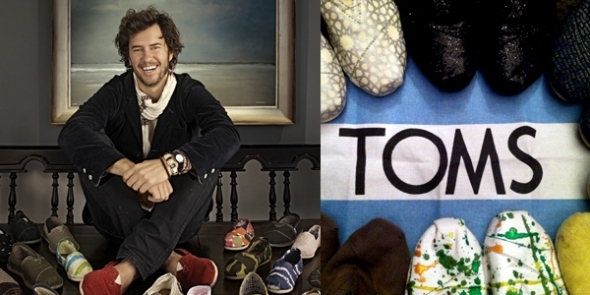 Blake Mycoskie got the idea for the TOMS brand after a visit to an Argentine village where few children could afford shoes. His concept, donating a pair of shoes for every pair purchased, was a huge success, proving that business and charity makes good sense. TOMS is an abbreviation for “tomorrow” – (as in sell a pair of shoes today, give a pair of shoes tomorrow). His idea has grown into a global movement: TOMS Shoes has provided over 35 million pairs of shoes to children since 2006, TOMS Eyewear has restored sight to over 275,000 since 2011 and TOMS Roasting Company has helped provide over 67,000 weeks of safe water since launching in 2014. In 2015, TOMS Bag Collection (in partnership with Christy Turlington ) was founded with the mission to help provide training for skilled birth attendants and distribute birth kits containing items that help a woman safely deliver her baby. People Magazine featured Blake Mycoskie in its “Heroes Among Us” section, and i n 2011 he was named on Fortune Magazine’s “40 Under 40” list, recognizing him as one of the top young businessmen in the world.